Can be used as a drowner lock, in-line swivel, or end swivel. Will fit a half-inch stake. Comes with rivets. Works on both 3/8 inch or 1/2 inch stakes. Comes with rivets. Lays flat, very strong, and used as an in line or an extension. Comes with two rivets. Wolf swivel with two rivets on end of chain to connect. The heaviest and smoothest operating swivel ever offered to the trapper. There is a big difference between this swivel and all others! The body on this swivel is 0.105 inch thick. Coyotes and large dogs cant close the Crunch Proofs swivel body down on the J-hooks causing the swivel to freeze up like others do. Recommended for any animal trapped in North America. 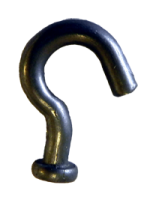 Strong enough for the toughest wolf, wolverine, bear, or mountain lion if the #6 J-hooks are welded. Ideal for the trapper or snareman. 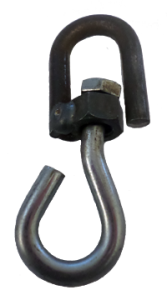 Use for attaching chain to stake ends, anchoring or extending a snare. Tempered 3/16 inch steel. Use with swivels or to connect two items. Works on both 3/8 or 1/2 inch stake with rivets. Ideal for the trapper and snareman. 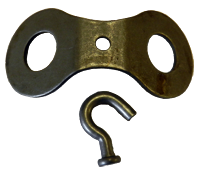 Use for attaching chain to stake ends, anchoring or extending a snare. Hundreds of uses on the trapline. The Heavy Duty S-Hook is designed to fit over 0.5 inch rerod without binding. Same swivel found on the MJ-600 traps. Will fit on any size chain.